Jaime Balius's - editor of El Amigo del Pueblo, the paper of the Friends of Durruti group - angry rebuttal of accusations that he was a Marxist. 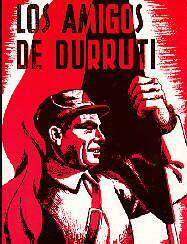 In Valencia's Fragua Social it has been claimed that I am a marxist. This innuendo by Fragua Social has been taken up by other mouthpieces and it has been argued that our Group (Agrupacion) was a ragbag of marxists and the like. At a plenum of anarchist groups I had to bite my lips to stop myself from answering a comrade who was reminding folk that I came from a certain political sector. And I also resigned myself to hearing from the lips of another person present at the plenum that I was driven by spite. The same thing was said of me in Solidaridad Obrera some time ago. I paid no heed. Later, on the occasion of the appearance of a weekly run by E. Carbo upon which I helped out as a sub-editor, the same charge was leveled against me. And on a number of occasions I have had to endure the same description being used with regard to me. Let me ask the comrades who have resorted to this innuendo why they call me a marxist. Can it possibly be that I am a marxist because I am a steadfast enemy of the petit bourgeois political parties and of the whole rabble who have lined their own pockets while invoking the revolution and still are, even though torrents of blood are being shed on the fields of battle? Do they call me a marxist because I am against collaborationism and because I understand our position to be a source of strength only to our enemies? Am I called a marxist because I have been candid enough to write and bring to public attention what other comrades only dare say around the cafe table? Why hang this label on me? Is it because in May I took the line that the uprising should continue until the Generalidad was annihilated utterly? Or could it be on account of my view that blood should not be spilled to no purpose and that whenever sacrifice is asked of the working class, it ought to bring them benefit rather than cost them ground? I require an explanation. If I am deemed a comrade at all, let someone tell me why I have been described as a marxist. I make no mention of the term agent provocateur because on that score there is a firm undertaking that both sides will retract the language used about the other. In our last issue we of the Friends of Durruti retracted the term 'treachery', for the sake of revolutionary anarchist unity AND WE EXPECT THE COMMITTEES to retract the description 'agent provocateurs'. That is only fair. It grieves me that at the present time there is somebody who dares call me a Marxist when I could refute with unanswerable arguments those who hang such an unjustified label on me. As one who attends our union assemblies and specific gatherings, I might speak of the loss of class sensibility which I have observed on a number of occasions. I have heard it said that we should be making politics - in as many words, comrades - in an abstract sense, and virtually no one protested. And I, who have been aghast at countless such instances, am dubbed a marxist just because I feel, myself to be a one hundred percent revolutionary. It is a chore to rally to one's own defence. But it is only fair and reasonable that my pen which has always keenly defended the CNT and the FAI should one day serve to defend my honour and my very life. Let me renew a few incidents from my record. On returning from exile in France in the days of Primo de Rivera I fought the Generalidad at a time when I could easily have been feathering my nest, and I have been a defender of the CNT and the FAI ever since. In spite of my paralysis, I have done time in prison and been taken in manacles to Madrid for my fervent and steadfast championship of our organisations and for fighting those who once were friends of mine Is that not enough? I have always been looked at askance to some extent. I, comrades do not have my roots in the workshop nor in the factory. I come from a bourgeois family. I was a medical student. And in the dissecting rooms, the hospitals, jails and in exile I have managed to rise above my origins - until now I identified wholly with the proletariat. So where is this marxism of mine? Is it because my roots are not in the factory? What fault is it of mine that I was born under the sign of absolute honesty arid have never lined my pockets in any way? In short, that I am not grasping like so many others are? The time has come to clarify my position. It is not good enough to say that the matter has already been agreed. The truth must shine through. As far as I am concerned, I call upon all the comrades who have used the press to hang this label upon me to spell out what makes me a marxist. Airing personal business does not come into this It is my very honour which is in question here. I require an explanation.